Anyone remember Michael Crichton’s Westworld (or the Simpsons parody)? In this dystopian 1973 sci-fi, tourists visit a triumvirate of fantasy theme parks staffed by robotic historical re-enactors: Roman World, Medieval World, and the titular West World, with its “lawless violence on the American Frontier.” When a virus infects the parks’ androids, James Brolin must fight a ruthless robot gunslinger—played by a stone-faced Yul Brenner—to the death. The film may look laughably dated, but the fears it taps into are anything but: 2001, Terminator, Battlestar Galactica, I, Robot, and even a Westworld remake in the works—the perennial theme of man vs. machine, as old in film at least as Fritz Lang’s silent Metropolis, becomes ever more relevant in our drone-haunted world. 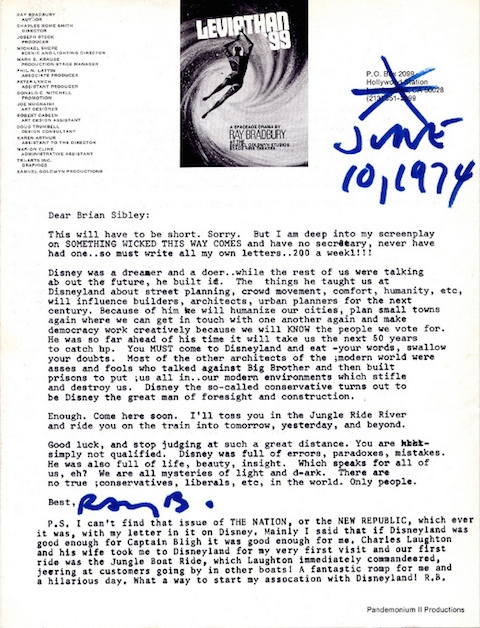 After his praise of Disney, Bradbury writes two agitated postscripts exploding what Sibley calls “ill-informed and prejudiced views” on robots. He classes automated entities with benign “extensions of people" like books, film projectors, cars, and presumably all other forms of technology. Notwithstanding the fact that books cannot actually wield weapons and kill people, Bradbury makes an interesting argument about fears of robots as akin to those that lead to censorship and enforced ignorance. But Bradbury’s counterclaim sounds a misanthropic note that nonetheless rings true given the salient examples he offers: "I am not afraid of robots," he states, emphatically, “I am afraid of people, people, people.” He goes on to list just a few of the conflicts in which humans kill humans, religious, racial, nationalist, etc. : "Catholics killing Protestants... whites killing blacks... English killing Irish...." It's a short sampling that could go on indefinitely. Bradbury strongly implies that the fears we project onto robotic bogeymen are in reality well-grounded fears of each other. People, he suggests, can be monstrous when they don't "remain human," and technology---including robots---only assists with the necessary task of "humanizing" us. "Robots?" Bradbury writes, "God, I love them. And I will use them humanely to teach all of the above." Read a transcript of the letter below, courtesy of Letters of Note, and be sure to check out that site’s new book-length collection of fascinating historical correspondence. Disney was a dreamer and a doer..while the rest of us were talking ab out the future, he built it. The things he taught us at Disneyland about street planning, crowd movement, comfort, humanity, etc, will influence builders architects, urban planners for the next century. Because of him we will humanize our cities, plan small towns again where we can get in touch with one another again and make democracy work creatively because we will KNOW the people we vote for. He was so far ahead of his time it will take is the next 50 years to catch up. You MUST come to Disneyland and eat your words, swallow your doubts. Most of the other architects of the modern world were asses and fools who talked against Big Brother and then built prisons to put us all up in..our modern environments which stifle and destroy us. Disney the so-called conservative turns out to be Disney the great man of foresight and construction. Good luck, and stop judging at such a great distance. You are simply not qualified. Disney was full of errors, paradoxes, mistakes. He was also full of life, beauty, insight. Which speaks for all of us, eh? We are all mysteries of light and dark. There are no true conservatives, liberals, etc, in the world. Only people. P.S. Can't resist commenting on you fears of the Disney robots. Why aren't you afraid of books, then? The fact is, of course, that people have been afraid of books, down through history. They are extensions of people, not people themselves. Any machine, any robot, is the sum total of the ways we use it. Why not knock down all robot camera devices and the means for reproducing the stuff that goes into such devices, things called projectors in theatres? A motion picture projector is a non-humanoid robot which repeats truths which we inject into it. Is it inhuman? Yes. Does it project human truths to humanize us more often than not? Yes. But...robots? God, I love them. I will use them humanely to teach all of the above. My voice will speak out of them, and it will be a damned nice voice.